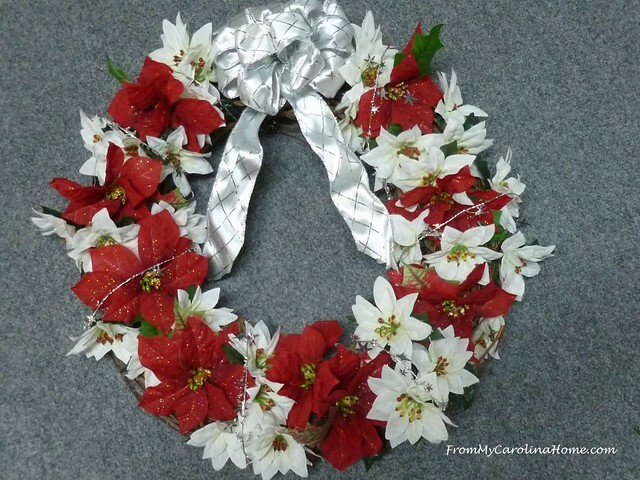 This year’s holiday wreath is silver and red, inspired by the number of silk poinsettias in the stash. 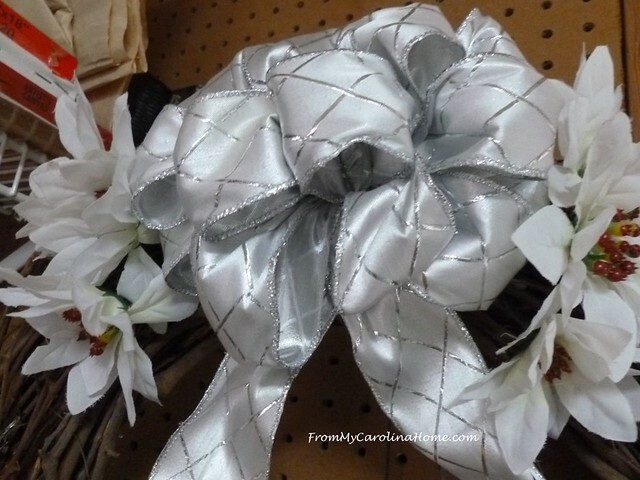 I have spools of wire edged ribbon and making big bows is very easy with it. I have a tutorial on making big bows HERE. Knowing I wanted a good size bow, I started with that. 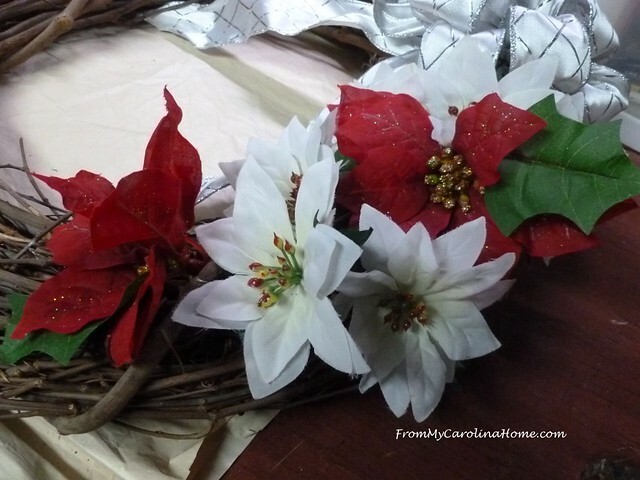 Attaching it to the grapevine base, I began adding poinsettia blooms on both sides. 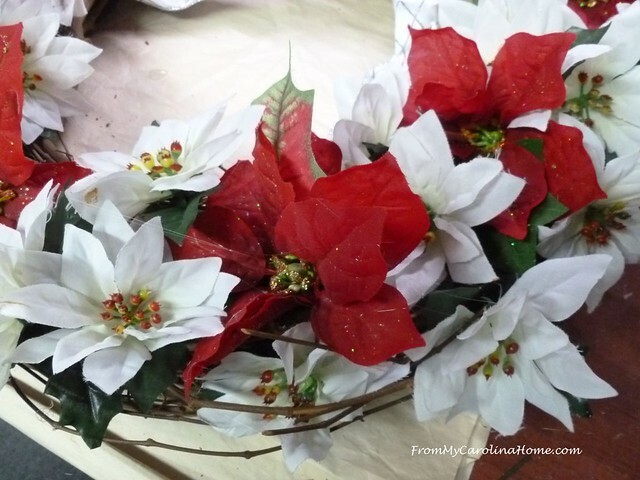 I had bunches of both red and white flowers, so I arranged them in a candy cane manner, with stripes of red and white. I thought I’d stop about halfway down, but it just seemed to want more. So I kept going with more flowers all around. Over the top I added a silver star wire garland, wrapping it around the outside of the flowers loosely. I delivered it to the Festival of Wreaths last week. 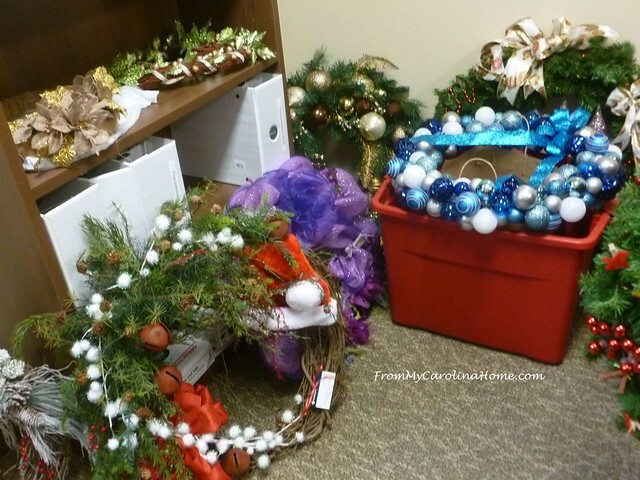 If you are local, the charity silent auction Festival of Wreaths benefiting Meals on Wheels is tomorrow, December 4 from 4-6 pm at the Lodge at Mills River, 5593 Old Haywood Road, Mills River, NC, 28759. They had quite a few when I delivered mine, and more were coming in this past week. I like the look of this one, with the wide mesh. Next time I’m going to try that. Have you hung a holiday wreath this year? Awesome! We have a silent auction of miniature quilts during our QuiltFest years (coming next June!) and last time and this coming we give all the proceeds to Meals on Wheel! It’s a great cause and helps so many people. When I worked home health, many of my elderly patients received this assistance. Unfortunately, that was the only meal some of them really had all day because they were unable to cook anything else or just didn’t have a lot of money to buy food. Thanks for sharing! Your wreath is beautiful. Thanks for the link to the bow making tutorial. I like that one too with the mesh. I don’t typically like the mesh wreaths but I like that there is minimal mesh and some nice ribbons and ornaments with it. Oh they are all marvelous. I just hung my crusty wreath on the fence gate this morning. It has fake greenery and Christmas balls made of PLASTIC. I am tired of it but no time this year. I do not want to think about that too much bc I will just have a melt down. 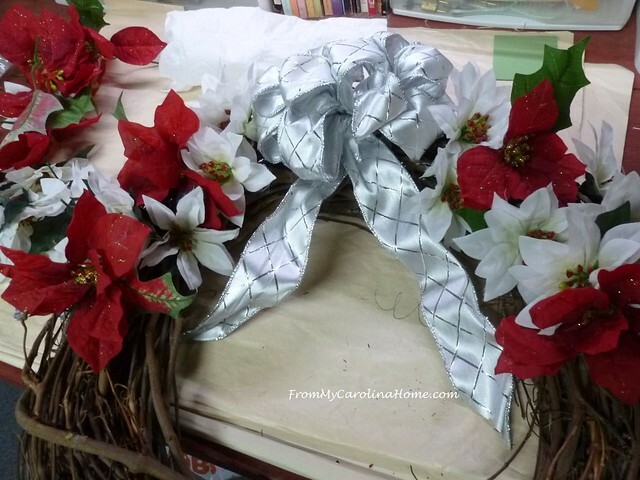 Hello Carole, Your wreath turned out beautiful! I think that is what I am going to do today, pull out all of my wreath supplies and just create until I can not do any more. I think it is fabulous what your community does to help out the Meals on Wheels program. Thank you for sharing and have a fantastic day! How beautiful!! I have a bunch of pinecones and the thought was to make a pinecone wreath however it still hasn’t happened….too busy I guess! 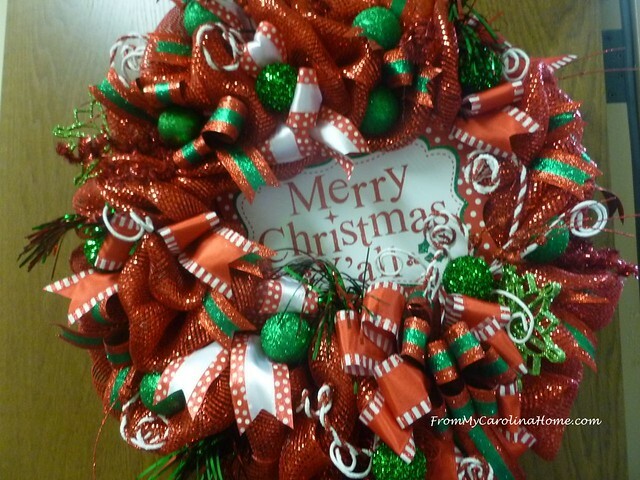 Beautiful wreaths! We just have a few simple ones in the house. I would really like to add a real wreath this year because they smell so good. Great wreath for a great cause! Red and silver is not used much, and I think it is so elegant. What a great fundraising idea and yours is beautiful! I really stress out over making wreaths. I’ve done a few but this year I gave in and purchased new ones. I love them and feel like it relieved a lot of pressure! PS what the heck happened to the Panthers? Tampa Bay? Really? 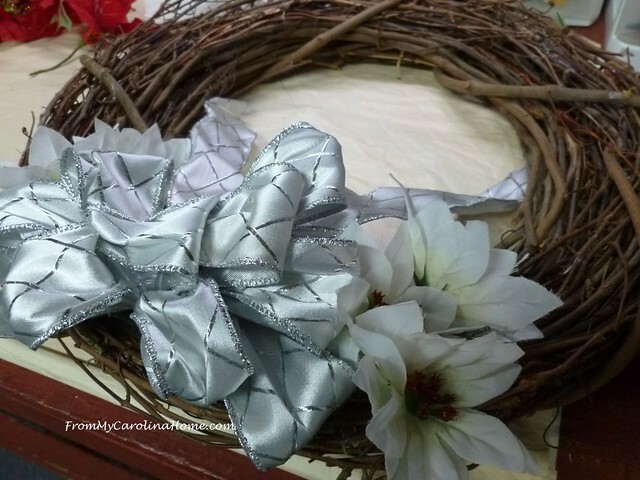 Great idea for your wreath and it looks great. The silent auction is a wonderful way to raise funds. Hope they get lots. It would have been interesting to see all the wreaths together.